In my search for something else, I happened upon Mary Miss’s exhibit at the Indianapolis Museum of Art (IMA) last fall, FLOW: Can You See the River? 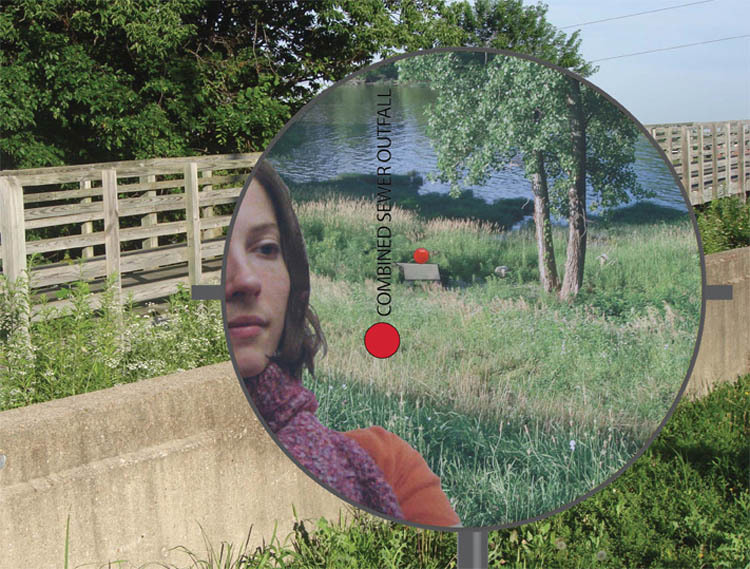 Mary Miss is a New York based artist who has been combining sculpture, landscape architecture, and installation art with the issues of our time, since the 1970s. Making environmental and social sustainability into tangible experiences is a primary goal. 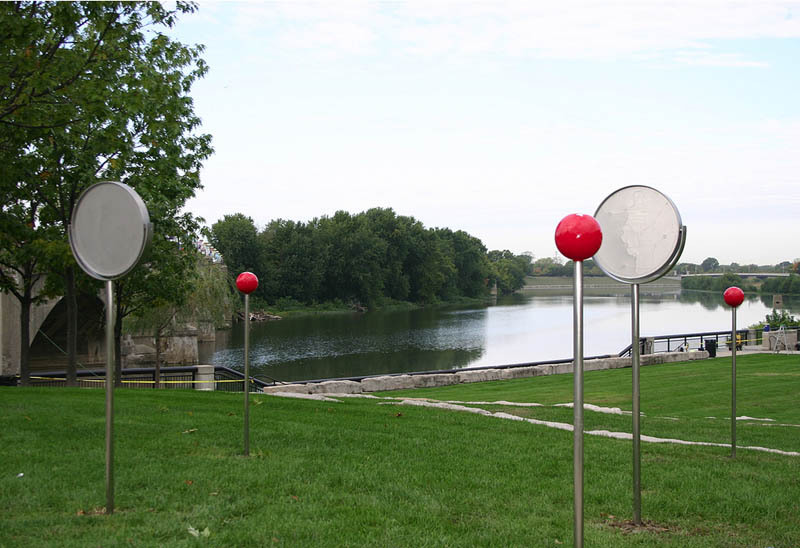 In FLOW, Miss reveals important elements of the White River water system through a series of mirror and red dot installations at stopping points along the river, engaging and educating visitors. Upon visiting Miss’s website I learned of a similar interesting project coming to NYC in 2013 — Broadway: 1000 Steps. Undergraduate and graduate students from these schools are conducting research that will inform hub content, mapping each of the hubs, collecting photos and relevant images, and proposing their own solutions to the MM/CaLL challenge. Research, data and visual materials collected by the students can be found at http://www.mmcallpartnership.org/. Student efforts will be completed by spring of 2012, and content development, design, and testing will be advanced during the summer and fall 2012. The goal of installing a majority of the hubs has been set to take place in spring/summer 2013, and it is expected that hubs will be in place for approximately one year. Additional information on the Broadway: 1000 Steps can be found here. 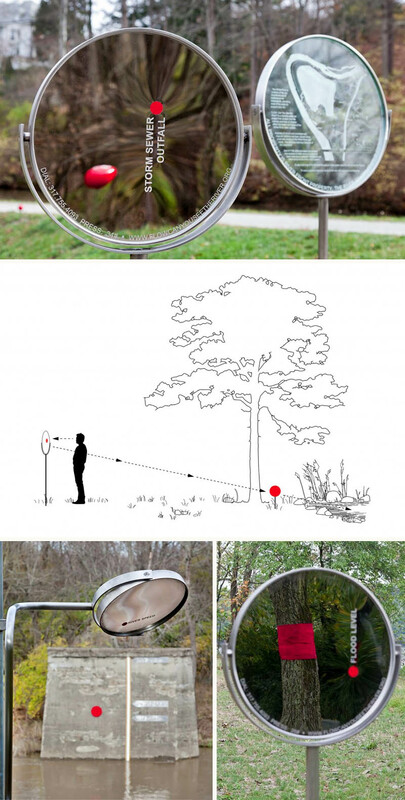 This entry was posted in Architecture, Art, Event, Interaction Design, NYC, Street Art, Stuff We Like. Bookmark the permalink.